A Taste of Burlington prix-fixe dining is coming back for its Winter 2011 programme. This only happens twice per year! Be sure to check out the updates on the great new elegant website, found here. Again, presenting sponsor for the programme is Wine Country Ontario. There are so many reasons to learn about culinary adventure in this region, and many reasons to be proud of all things culinary that our city and southern Ontario boast. There are many fabulous new contests for diners partaking in the A Taste of Burlington Winter 2011 programme; in conjunction with new sponsors Visit Myrtle Beach South Carolina, The Marina Inn at Grande Dunes, and Porter Airline, as well as Hamilton Magazine, Wine Country Ontario, and Balance My Life. 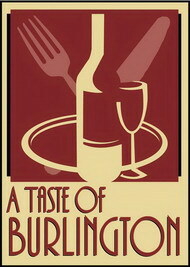 There’s also the Taste of Burlington e-newsletter sign-up contest, just for going onto the website and signing up. Of the twenty-four participating restaurants in A Taste of Burlington, sixteen are located in the Downtown Burlington Business Association area. They are: Beaver & Bulldog Neighbourhood Taps & Grille, Downtown Bistro & Grille, Eatalia, Elgin Terrace Restaurant, Honey West Restaurant & Lounge, La Costa Nuova, Latitude, The Martini House Bistro, Paradiso, Pepperwood Bistro, Red Canoe Bistro, The Rude Native Bistro & Lounge, SB Prime, Siam Dish, The Alex Restaurant, and The Water Street Cooker. Whew! This is a great time to zone in on even two or three that you have never been to before. A Taste of Burlington means that set-price menus are available at all these restaurants. Be sure to check out the Taste of Burlington website in advance, see the lunch or dinner options, pricing for that restaurant, and the exquisite, memorable three-course dining meal that you get for an amazing price. Mention when you make reservations that you would like to take part in A Taste of Burlington and have something from that menu. The restaurants have come up with these special Taste of Burlington menus that are available for the duration of the programme only: Monday February 21 through to Sunday March 13, 2011. Bon appétit! Grab your date, family or your co-workers and get out on the town. Our extremely talented local chefs would love to show off to you what they create!